Bali is a perfect place to take your kids. They will love the natural surroundings with the amazing views. There is no problem whatsoever to find a baby-sitter or somebody to take care of them wherever you go. 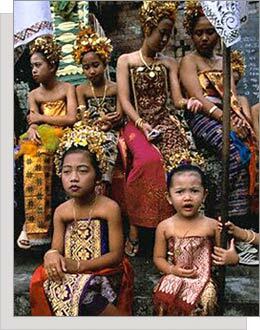 All Balinese adore kids! Children's attractions in Bali vary from surf, sand and beach activities; cultural activities such as dancing, temple visits, and traditional Balinese life style experiences; adventure activities such as rafting, cycling, bungee jumping and elephant rides; and theme parks such as Bali Bird Park, Waterbom, Butterfly Park, etc. Free joining of The Gecko Kid's Club including supervised games and other fun-filled activities. Free amission to the Kids Club including supervised games and other fun-filled activities.